We have two meeting points for our tours. The Vieux Lyon tour starts on Place Saint-Jean and the City Tour starts on Place des Terreaux. Here you can find pictures of the exact place we meet and links to google maps. This way, it should be very easy to find the meeting points! This tour starts on Place Saint-Jean, at the statue in the middle. 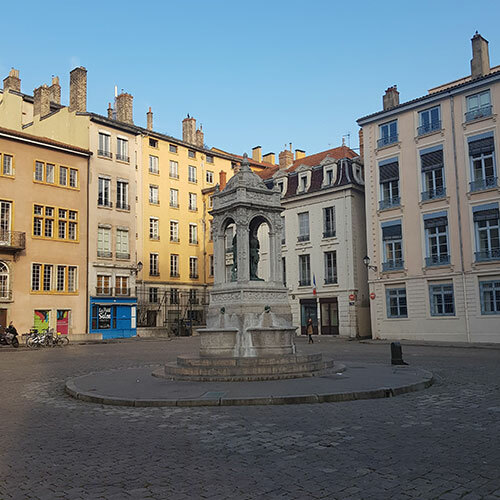 It is the main square of Vieux Lyon and is located right in front of Cathedral Saint Jean. It is easy to walk here if you stay in the city center, otherwise take the metro to metro stop Vieux Lyon, which is right around the corner. You can also click on this link to see where the meeting point is on Google Maps. The days of this tour are Monday, Wednesday, Thursday and Saturday. This free tour starts on Place des Terreaux. Place des Terreaux is the main town square of Lyon, where you find City Hall and the Fine Arts Museum. 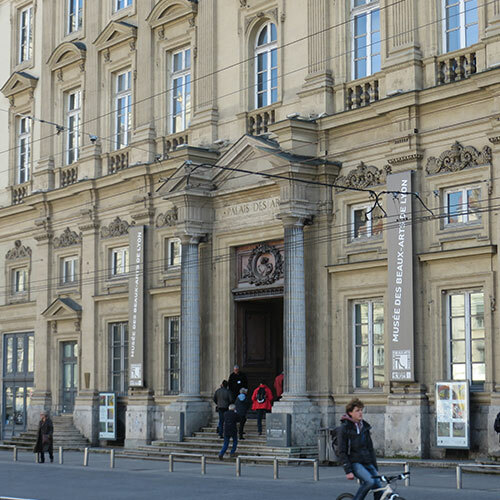 We start next to the door of the Museum. It is easy to get here. You can walk, or take the metro to Hotel de Ville. The square is just on the other side of City Hall. The days of this tour are Tuesday, Friday and Sunday.